Well I’ve been doing far to much ranting and far too little hard science recently so here’s something everyone can enjoy! In NZ we’re really lucky at this time of the year to have a great view of the planet Saturn which appears over the eastern horizon after dark and rotates upwards and towards the north as the night goes on. It can be a little tricky to find if you’re not familiar with the skies though! So look for two bright ‘stars’ on a flat line above the eastern horizon. If you’re doing this at dusk these will be the only two ‘stars’ visible. The right hand one (southernmost) is a star called Spica, the main star in Virgo, a blue giant blazing away about 260 light years away from us. The left hand one (northernmost) is actually the planet Saturn and often has a distinct yellow/cream hue through a pair of binoculars. Through a large telescope it looks magnificent, and entirely ‘cartoonish’, exactly like this image (excepting the aurora!). The famous rings were initially described as ‘ears‘ (think ears on a teacup rather than the biological variety) by Galileo, and their is still a considerable amount of debate as to their origin. Two of the main theories are that they are leftover debris from Saturn’s formation or the remnants of moons destroyed by the tidal forces between Saturn and its satellites. On good clear nights, of which there weren’t many during the ‘International Month of Astronomy’ (April), a decent telescope can make out several of the big moons as dots of light on either side in line with the equatorial belts. 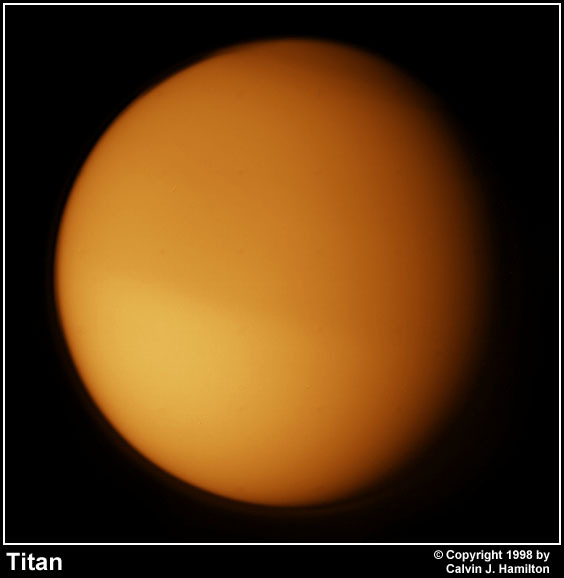 The most obvious of these is the largest, Titan, boasting a radius greater than that of the planet Mercury and, perhaps most surprisingly, an atmosphere of mostly Nitrogen and Methane which it what gives it its famous ‘orange’ glow. 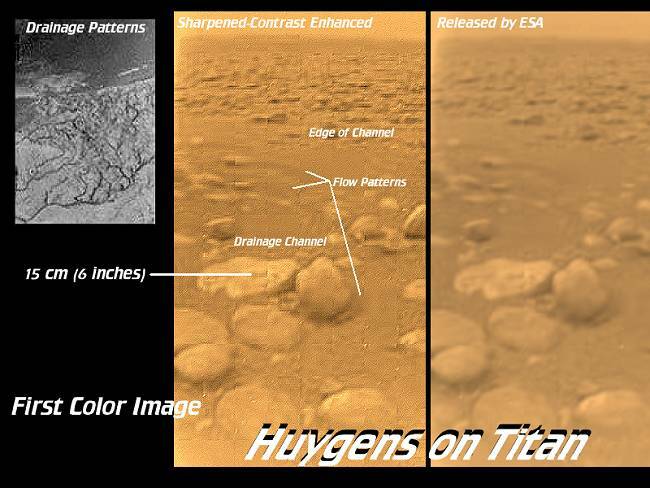 The truly spectacular character of Titan’s surface was only hinted at during the Huygens Probe mission to its surface in early 2005. The discovery of what is now thought to be liquid methane pools on its surface, and a landscape that was shaped by the movement of this liquid marked the first time this had been found currently occurring anywhere other than on the earth (although there are suggestions of this occurring on Mars in the past). So if you haven’t had a chance yet, go out and take a look! Both Saturn and Spica are pretty spectacular even just with a pair of binoculars!